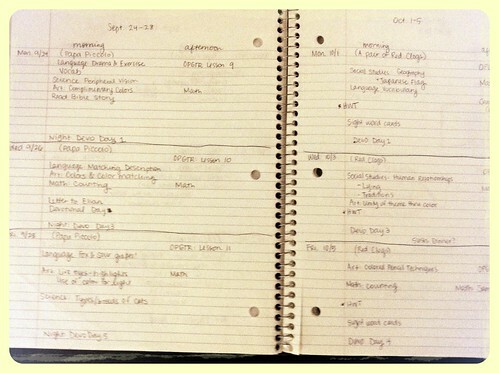 Update, September 2014: I still do my planning like this, but I use my homemade planner that's pieced together with some really useful printables. I thought it would be fun to share how things have evolved during our first year of homeschooling. While I started out with the intentions of following my own detailed lesson plans, things have actually shifted quite a bit. We've basically given up on Five in a Row-- I loved it but struggled with the motivation to fit so many lessons into our days. I was a teacher before I had Gigi, did you know that? I taught college-level Spanish at Cal State Long Beach. So I've done my fair share of lesson planning over the years and it's something I enjoy. But when the reality of having a one-and-a-half-year old and an almost-three-year old set in I came to realize that not only could we flat-out not do formal school lessons in the morning, but we also weren't really getting to much of detailed plans. 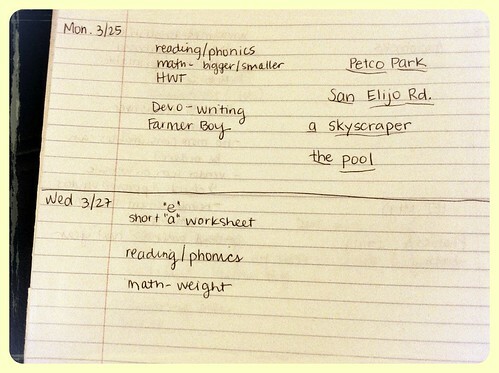 So now we're simply doing what I affectionately refer to as upside down and backwards homeschool planning. I now have whittled our plan down to the basics: reading, writing, math, and devotional, and anything else is extra. She gets also gets science, Spanish, art, drama and chess once a week each at school so I figure she's at least brushing the surface of those subjects which is fine for kindergarten in my opinion. This helps me not feel overwhelmed by planned lessons left undone, but still gives me a running record of what we've done so that at the end of the month I can write up my summary and gather samples to turn in to our EF (educational facilitator). It's sort of homeschool survival mode, but that's just the season we're in. Next year, when we'll be diving into a classical education for Gigi and the little ones will be so many months older, we'll try to gradually add back in doing school in the mornings. I'd love to hear how you plan your homeschool days if you are a home educating family. I'm currently in planning mode for next year so I'm on the lookout for new ideas, methods and tools!